I chuckled when I saw Lisa Sorg’s “Urban Archaeology” column in the September 4th issue of IndyWeek. 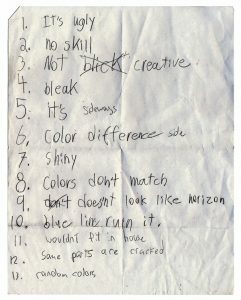 From our 2008 exhibition Circa 1958, Lisa had saved a piece of paper that she’d found in one of the galleries with notes from an elementary school student who had visited the show. Evidently, art by Robert Rauschenberg, Kenneth Noland, Bruce Conner, Ed Kienholz, and other titans of contemporary American art had left this student thoroughly unimpressed (see left image). 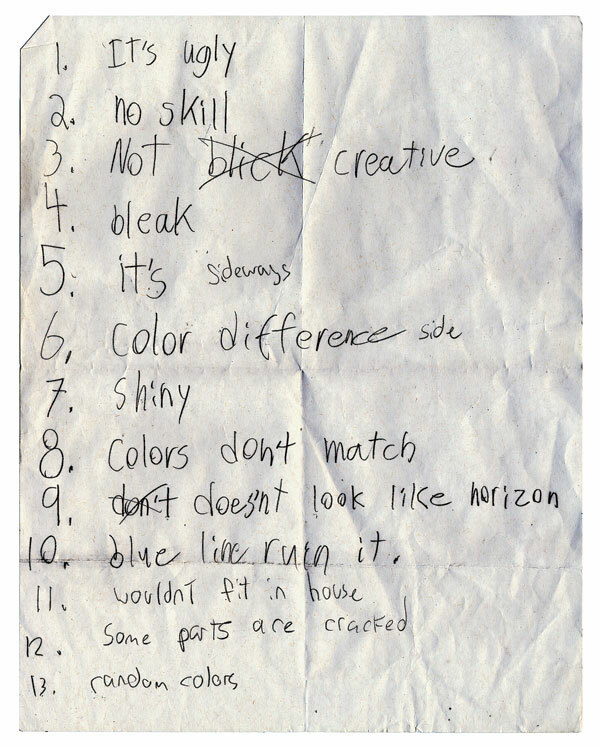 This “excavated” list of criticisms reminded me of how much fun I have reading the comments that children leave in the comment book that we have in our lobby. Though not presented specifically for children, kids seem to have no problem expressing themselves in it. Sometimes visitors love what they see and want more. Maybe this young visitor will one day underwrite a larger building for the Ackland’s collection! This entry was posted in Looking Back and tagged comment book, communications, feedback, museums, Visitor Experience. Bookmark the permalink.